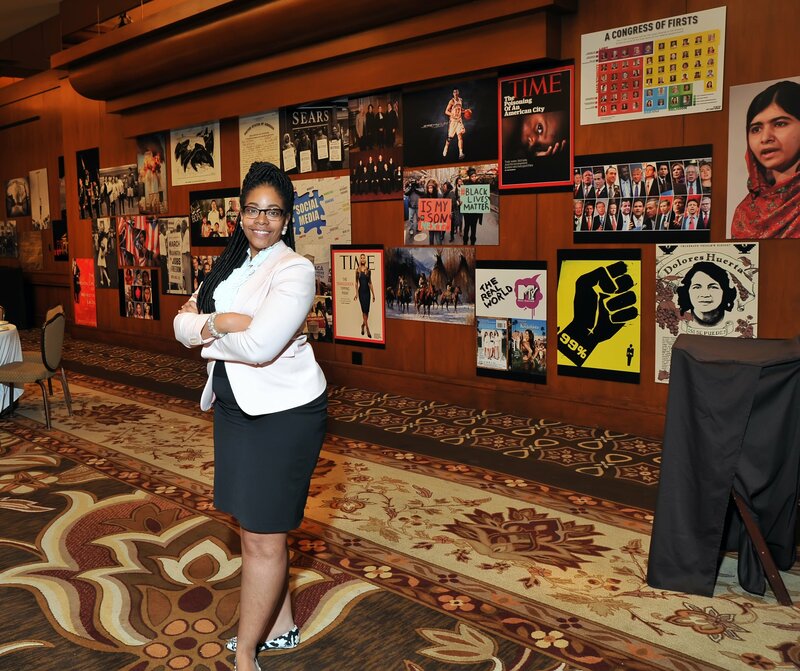 Candace Stanciel standing in front of photo wall she curated for the 2016 Gathering of Leaders. I am the Director of Convenings here at New Profit, which means I'm responsible for bringing together academics, policy leaders, funders and practitioners around the community issues we are interested in solving. When I was considering my next step professionally, I knew that being a part of decisions around funding the work for social good was a critical piece to creating change in our country. New Profit has a particular perspective on this that I thought was interesting and has real implications for how we move our sector forward. Generally, working in the social sector has been about creating opportunity for everyone to have a life they desire. In college, I discovered the concept of Maslow's hierarchy of needs [below], which led me to believe that each of us is seeking self actualization and to be able to do that it means we have to have our basic needs met and we have to have choice. I have a sister who is also named Candace, which most people find surprising. I didn't know about her growing up. She’s much older. When my parents were married many years later, my mom named me Candace. When I found out about her, it was very shocking. We are both my father's children. Professionally speaking, what's probably surprising to people is that I used to spend my time on a tour bus traveling all over the world doing concerts for artists like Ludacris, Destiny’s Child and Floetry. I also managed red carpets with Prince, Oprah and Mary, Mary among many others. People don't always think that lines up with the life that I currently have. I'm currently working on my bucket list item to visit every NFL stadium in the country. I love football and just am fascinated by stadiums. So far I have visited eight out of thirty-one. I have been to see the Jacksonville Jaguars in Florida, the Atlanta Falcons in Georgia, the Carolina Panthers in North Carolina, the Oakland Raiders in California, the San Francisco 49ers in California, the Detroit Lions in Michigan, the Titans in Tennessee, the New Orleans Saints in Louisiana and the Arizona Cardinals. I’m currently working on getting to Gillette Stadium to see the Patriots. I’d also love to visit more countries in Africa. I’ve been to South Africa twice and I just think there is so much to see. The continent is amazing! I have this shirt that says "I love God and trap music." It sums me up well! If I had to pick specific songs, I would say the current gospel track I'm loving is “For Your Glory” by Tasha Cobbs. It speaks to the idea that “I will go wherever You tell me to go, I will be whatever You tell me to be Lord if this is going to serve your purpose.” I feel like right now I'm in a sacrificial space of life, living in Boston for others and what I believe is a bigger vision for my life. So that would be my I love God song. Then on my trap music side, I’m struggling to pick one today. Instead of TI or 2 Chainz, let's turn elsewhere. I always come back to “Beautiful Skin” by Goodie Mob. Also, "Blessed" by Jill Scott always resonates with me. Lion Woman’s Legacy: An Armenian American Memoire by Arlene Voski Avakian, and no one has ever heard of it. This book changed my life. I read it for a Women's Studies course in undergrad, but it's a book that I pick up every year and reread to remind myself about the power of a woman's voice in dictating her own future. This story is about Armenian women and includes a whole cultural piece to that I very much identify with as an African-American woman. There's a lot in this book about how you define your own destiny and how you might have to challenge the notion of what other people believe you can be or are capable of. For me, that resonates deeply, particularly from my own background of where I’m from and what people often believe I should be. As a young black girl from Mississippi, a very impoverished town, with very little educational opportunity, I sit where I sit and I don’t take that lightly. My first gut reaction in answering this question is to say my dad. I think that my father is brilliant, he's just good at life. He's great at work. He's great at being a great friend, being a great dad, being a great person who loves people, who will help people. So, when you see someone who has the life thing down, you want to mimic that in all things. I would definitely say I learned a lot from my dad about how to be good at life. I'm inspired by resilience. I think there has been so much hurt and pain that we as human beings have inflicted upon one another and yet we continue to believe that we can be better and good to one another and that's very powerful. I'm inspired by seeing resilience and I think children are some of the best examples of it. Secondly, I do believe that we are born with a particular purpose and it takes our whole lives to discover it. It’s a long road but I do feel as if I'm on the track of discovering mine. So, in this work for me, it's more like this is what I'm supposed to do. It’s not so much that I think about whether I should or question it as much as I just think this is what I'm supposed to be doing. It just feels very natural.